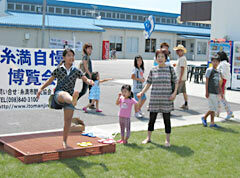 Okinawan sandal flinging contest offered in the Itoman Charms Expo, and now to be held at All Southern Okinawa Expo. (Taken by the Itoman City Tourism Association, at Itoman in 2010). From October 27 to November 18, the All Southern Okinawa Expo, in which people can enjoy sightseeing options featuring the tradition and culture of the southern part of Okinawa will be held for the first time. There will be peace-education programs, bus tours to visit communities holding dragon-boat races, and over 100 tourism options such as sightseeing in towns guided by the local residents. It is hoped that it will help to revitalize southern Okinawa using the tourism resources of each area. A total of four cities and three towns will co-host the event: Naha, Tomigusuku, Itoman, Nanjo, Yaese, Yonabaru and Haebaru. The exposition is an extension of the Itoman Charms Expo, which has been held in Itoman since 2010. The executive committee hopes that it will also help promote the 32nd Japan Bountiful Ocean Festival, which will be held in Itoman on November 17 and 18. A charge will be involved for all of the options. The official program of each community will be decided beyond the end of July. For further information, call the organizer at 098 (840) 3100.